Hello and welcome to Taylored Expressions January release! This is day #1 of the sneak peek! 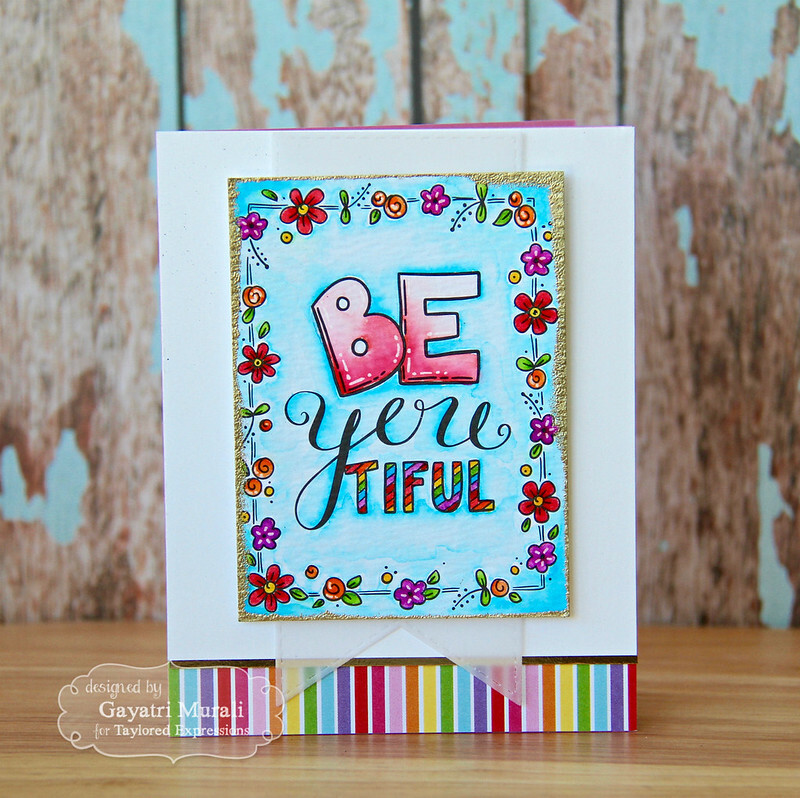 There are plenty of beautiful stamp set and dies to be released on Thursday. 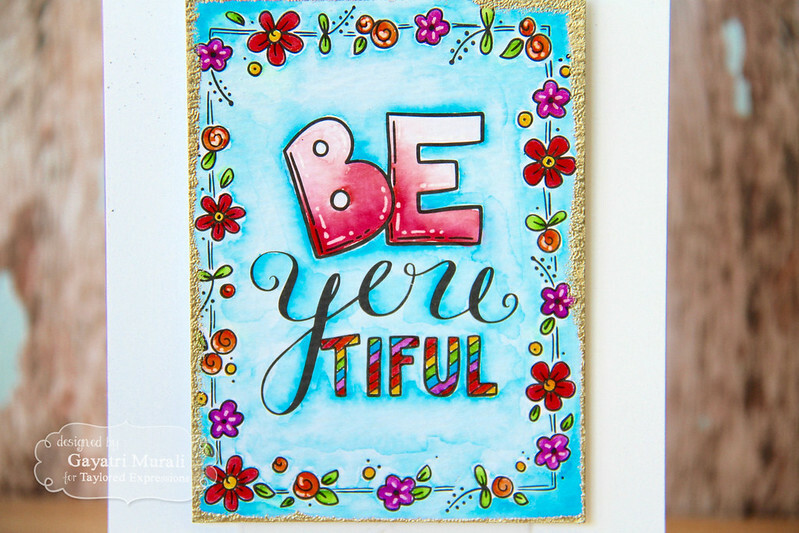 But today I am showcasing two new products – a die and a watercolor panels. First is the Hello Script die. Love how rounded and flowing the script is! A great hello die is a great in your collection. You can never have enough of word dies especially Hello! 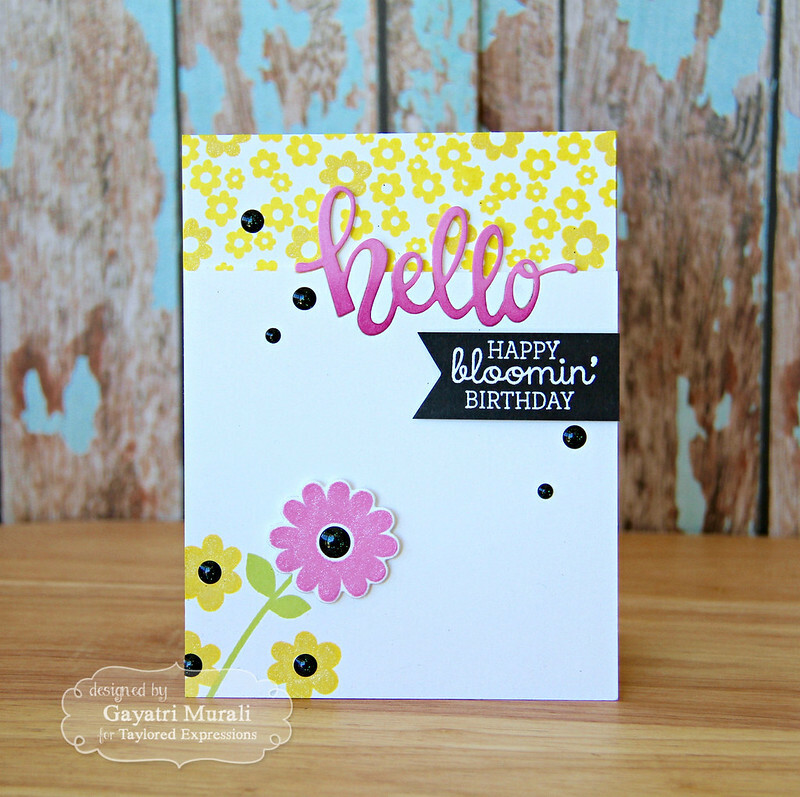 I used the Hello Script die along with Bloomin’ Birthday stamp set. I trimmed Sugar Cube card stock to 4.25″x 4.75″ size. I die cut Hello script on the top right corner of the panel. I stamped the flowers and leaves from Bloomin Birthday stamp set on the bottom left corner of the panel using TE Lemon Meringue and Granny Smith dye inks. I stamped the bigger flower using TE Strawberry Milkshake dye ink and die cut using the coordinating die. I adhered the flower die cut on the top of the leaf stem stamped image as shown. 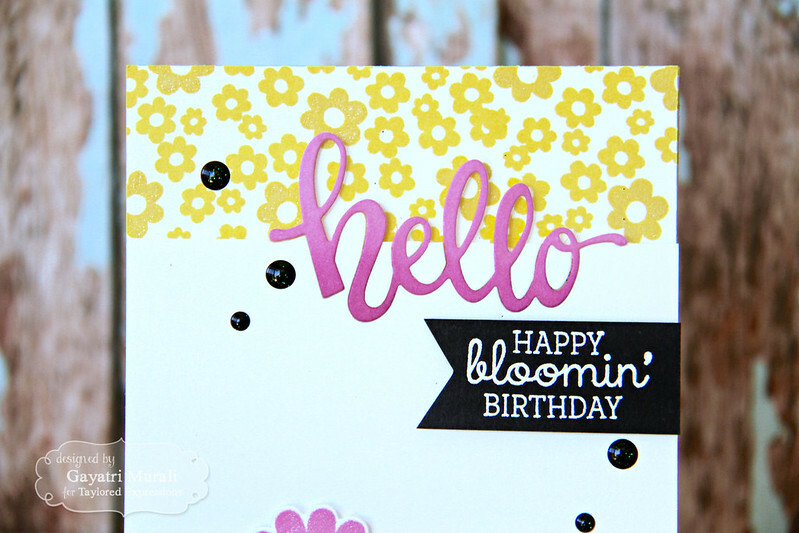 On top of the card front, I stamped the cluster of flowers from Bloomin’ Birthday stamp set using TE Lemon Meringue dye ink. Then adhered the panel on top of the card front using foam adhesives. I then sponged the Hello Script die cut using TE Strawberry Milkshake and Lollipop dye ink and inlaid the die cut back in place along with the bits and pieces. I then added secondary sentiment from Bloomin’ Birthday stamp set. I white heat embossed the sentiment on Oreo cardstock, trimmed fish tail end on one side and adhered using foam adhesives. 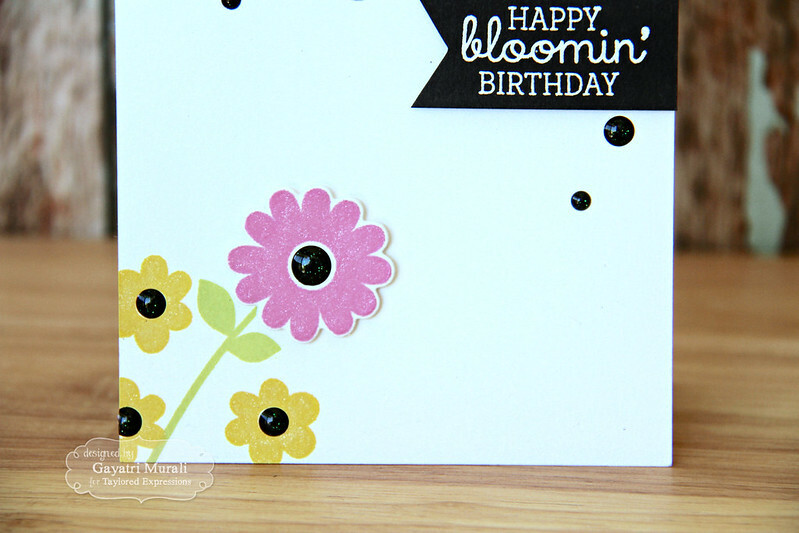 Then I embellished the flowers and the card front using Beetle Sprinkles enamel dots from Doodle Bug. The second product I am showcasing today are the Watercolor Panels: Inspire! There are four designs and three of each in the set. 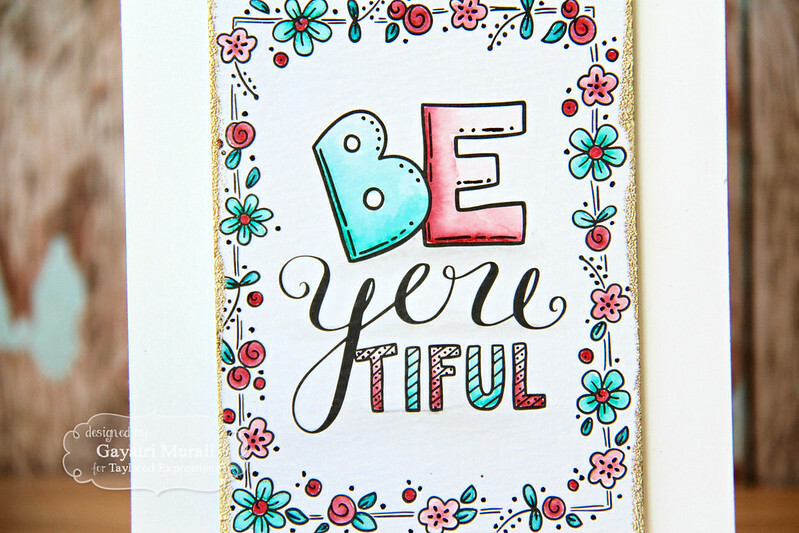 I am sharing one of the designs called BeYOUtiful! I watercoloured two of the panels and made two cards. This panel I coloured using bright rainbow colours using Zig Clean Brush Pen. I then added versamark to the edges of the panel and added gold embossing. To make the card I trimmed Sugar Cube panel to 4.25″x 5″ in size, adhered a strip of gold mirror cardstock. On the bottom of the card front I adhered a strip of rainbow striped pattern paper from TE Rainbow Brights pattern paper pack. Then adhered the sugar cube panel on top. I then added a stitched banner diecut die cut using the largest die from the Stitched Banner Stacklet. Finally the watercoloured panel using foam adhesives. The second card follows a similar layout except for the variation of colours on the panel, pattern paper and absence of vellum banner. The pattern paper is from Hello Happiness pattern paper pack. The inspiration for the colours came from this pattern paper. Here is a closeup of the card. See you tomorrow with day #2 of the sneak peek. Love the cards. I love the spring feel and the awesome colors. The pre stamped card is beautiful. Love the colors and design. I think Blue is a good color for the family addition..